The answer is what you've suspected all along: storks! When two people really love each other, a stork comes and brings them a baby! Right? Right! In Where Do Babies Come From you control the winds to guide your stork to the expecting home. The faster you can deliver the baby, the better! 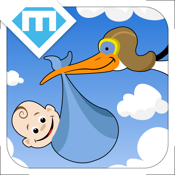 Download Where Do Babies Come From now to experience a bunch of fun, clever levels and make a lot of homes happy! WDBCF was built by Brandon Yang through MakeGamesWithUs. Visit www.MakeGamesWithUs.com if you want to build your own iPhone game!